Halifax is the largest city in the Canadian province of Nova Scotia and in Atlantic Canada. In Halifax, there are 15 buildings that stand taller than 70 metres (230 ft). The tallest building in the city is the 32-storey, 98 m (322 ft) Fenwick Place, though the most famous buildings are the Purdy's Wharf towers which are the second- and eighth-tallest buildings in the city. These buildings were constructed in a modernist architectural style, representing the city's efforts to add visual interest into the skyline. The third-tallest building in the city is 1801 Hollis Street, standing at 87 m (285 ft) tall with 22 storeys. As of June 2017[update], the city contains 9 skyscrapers over 75 m (246 ft) and 93 high-rise buildings that exceed 35 m (115 ft) in height. This list ranks Halifax high-rises that stand at least 65 m (213 ft) tall, based on standard height measurement. This includes spires and architectural details but does not include antenna masts. The Dominion Public Building is a 13-storey art deco-style office building located in Halifax, Nova Scotia. Completed in 1936, it originally served as the central post office for the City of Halifax and contained various other government offices. A four-story addition using similar materials was added to the building during the 1960s. The building underwent extensive interior renovations and upgrading during the early 1990s, and the sandstone exterior was removed, cleaned, and then restored between 2008 and 2009. This also allowed the building's steel frame to be repaired and restored. Province House is where the Nova Scotia Legislature, known officially as the Nova Scotia House of Assembly, has met every year since 1819. The building is Canada's oldest house of government. Standing three stories tall, the structure is considered one of the finest examples of Palladian architecture in North America. It commenced operation on February 11, 1819. 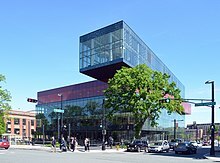 The Halifax Central Library stands at the corner of Spring Garden Road and Queen Street. It serves as the flagship library of the Halifax Public Libraries, replacing the Spring Garden Road Memorial Library. The library won a Lieutenant Governor’s Design Award in Architecture for 2014 and a Governor General's Medal in Architecture in 2016. (residential) 109 m (358 ft) 33 2013 Approved Upon completion, this building will be the tallest building in Atlantic Canada and tallest on the eastern seaboard of North America north of Boston. Part of King's Wharf. (residential) 102 m (335 ft) 34 2015 Under Construction When rebuilt, Fenwick Tower will be the tallest fully residential tower east of Montreal. (office) 100 m (330 ft) 22 2016 On-hold Upon completion, this will be the tallest office building in Atlantic Canada. (residential) 71 m (233 ft) 20 2013 Under Construction Approved by HRM Regional Council on May 10, 2011. (mixed use) 70 m (230 ft) 17 2015 Approved Part of the massive King's Wharf development in Dartmouth. (residential) 64 m (210 ft) 18 2014-2015 Approved Part of the massive King's Wharf development in Dartmouth. (office) 52 m (171 ft) 10 2015 Approved Part of the massive King's Wharf development in Dartmouth. (residential) 56 m (184 ft) 18 2014 Completed Part of the redevelopment of the Citadel Halifax Hotel. (hotel) 49 m (161 ft) 16 2014 Completed Part of the redevelopment of the Citadel Halifax Hotel. (Residential) 36 m (118 ft) 12 2013 Completed Part of the massive King's Wharf development in Dartmouth. (commercial) 64 m (210 ft) 18 2015 Under Construction The Nova Centre will replace Halifax's current World Trade Centre. (Residential) 150m 48 2014 Scrapped If built, the towers would have been the largest buildings north of Boston and largest in Atlantic Canada. Project has been redesigned from 27 storeys to 48. ^ a b c "Fenwick Tower". Skyscraper.com. Retrieved December 17, 2011. ^ "Halifax Skyscraper map". Skyscraperpage.com. Retrieved February 12, 2011. ^ "The History of Fenwick Tower". Templeton Properties. Archived from the original on August 13, 2009. Retrieved December 17, 2011. ^ "Purdy's Wharf Tower II". Skyscraper.com. Retrieved December 17, 2011. ^ "1801 Hollis". Skyscraper.com. Retrieved December 17, 2011. ^ "Barrington Tower". Skyscraper.com. Retrieved December 17, 2011. ^ "TD Building". Skyscraper.com. Retrieved December 17, 2011. ^ "Cogswell Tower". Skyscraper.com. Retrieved December 17, 2011. ^ "Maritime Centre". Skyscraper.com. Retrieved December 17, 2011. ^ "Queens Square". Skyscraper.com. Retrieved December 17, 2011. ^ "Purdy's Wharf Tower I". Skyscraper.com. Retrieved December 17, 2011. ^ "Bank of Montreal". Skyscraper.com. Retrieved December 17, 2011. ^ a b "Duke Tower". Skyscraper.com. Retrieved December 17, 2011. ^ "Founders Square". Skyscraper.com. Retrieved December 17, 2011. ^ a b "Tupper Building". Skyscraper.com. Retrieved December 17, 2011. ^ "Park Victoria". Skyscraper.com. Retrieved December 17, 2011. ^ "Summer Gardens". Skyscraper.com. Retrieved December 17, 2011. ^ "Ignatius Loyola Residence". Skyscraper.com. Retrieved December 17, 2011. ^ "Metropolitan Place". Skyscraper.com. Retrieved December 17, 2011. ^ "CIBC Building". Skyscraper.com. Retrieved December 17, 2011. ^ "The Trillium on South Park". Skyscraper.com. Retrieved December 17, 2011. ^ "King's Wharf". Skyscraper.com. Retrieved December 17, 2011. ^ "International Place". Skyscraper.com. Retrieved December 17, 2011. ^ "Horizon Court III". Skyscraper.com. Retrieved January 15, 2013. ^ "Case 01231 – Development Agreement – 1595 Barrington Street" (PDF). Halifax Regional Municipality. April 13, 2011. Retrieved December 17, 2011. ^ a b "Nova Centre Hotel". Skyscraper.com. Retrieved December 17, 2011. ^ "King's Wharf III". Skyscraper.com. Retrieved December 17, 2011. ^ "King's Wharf Office". Skyscraper.com. Retrieved December 17, 2011. ^ a b c "the SkyscraperPage Forum". skyscraperpage.com. April 13, 2011. Retrieved January 16, 2013. ^ "King's Wharf Apartments". Skyscraper.com. Retrieved December 17, 2011. ^ "Nova Centre". skyscraperpage.com. April 13, 2011. Retrieved January 16, 2013. ^ "Nova Centre Offic". Skyscraper.com. Retrieved December 17, 2011. ^ "YMCA Tower 2". Skyscraper.com. Retrieved December 17, 2011. ^ "YMCA Tower 1". Skyscraper.com. Retrieved December 17, 2011. ^ "The Alexander". Skyscraper.com. Retrieved December 17, 2011. ^ "Roy Building development". Skyscraper.com. Retrieved July 4, 2016. ^ "United Gulf Development South Tower". Skyscraper.com. Retrieved December 17, 2011. ^ a b "Twisted Sister developer proposes taller buildings". CBC News. July 21, 2011. Retrieved December 17, 2011. ^ Zaccagna, Remo (October 20, 2011). "Downtown twin towers to incorporate 'visionary' design". The Chronicle Herald. Retrieved December 17, 2011. ^ "United Gulf Development North Tower". Skyscraper.com. Retrieved December 17, 2011. ^ "307 Prince Albert Road". Skyscraper.com. Retrieved December 17, 2011. ^ "Case 16898: 307 Prince Albert Road & 5 Glenwood Avenue, Dartmouth". Halifax Regional Municipality. May 26, 2011. Retrieved December 17, 2011. ^ "Timeline of tallest building in Halifax". skyscraper.com. Retrieved March 3, 2011. ^ "Hotel Nova Scotian". skyscraperpage. Retrieved March 4, 2011. ^ "Dominion Public Building". skyscraperpage. Retrieved March 4, 2011. This page was last edited on 3 March 2019, at 07:28 (UTC).